WEST LAFAYETTE, Ind. 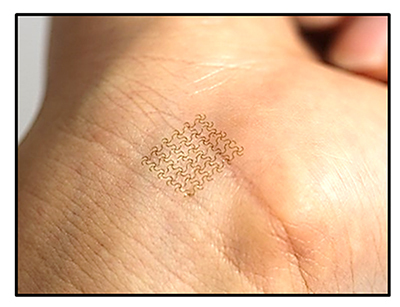 – A skin-like biomedical technology that uses a mesh of conducting nanowires and a thin layer of elastic polymer might bring new electronic bandages that monitor biosignals for medical applications and provide therapeutic stimulation through the skin. The biomedical device mimics the human skin's elastic properties and sensory capabilities. "It can intimately adhere to the skin and simultaneously provide medically useful biofeedback such as electrophysiological signals," said Chi Hwan Lee, an assistant professor of biomedical engineering and mechanical engineering at Purdue University. "Uniquely, this work combines high-quality nanomaterials into a skin-like device, thereby enhancing the mechanical properties." The device could be likened to an electronic bandage and might be used to treat medical conditions using thermotherapeutics, where heat is applied to promote vascular flow for enhanced healing, said Lee, who worked with a team that includes Purdue graduate student Min Ku Kim. Traditional approaches to developing such a technology have used thin films made of ductile metals such as gold, silver and copper. "The problem is that these thin films are susceptible to fractures by over-stretching and cracking," Lee said. "Instead of thin films we use nanowire mesh film, which makes the device more resistive to stretching and cracking than otherwise possible. In addition, the nanowire mesh film has very high surface area compared to conventional thin films, with more than 1,000 times greater surface roughness. So once you attach it to the skin the adhesion is much higher, reducing the potential of inadvertent delamination." Findings are detailed in a research publication appearing online in October in Advanced Materials. The paper is also available online at http://onlinelibrary.wiley.com/doi/10.1002/adma.201603878/full and was authored by Kim; postdoctoral researcher Seungyong Han at the University of Illinois, Urbana-Champaign; Purdue graduate student Dae Seung Wie; Oklahoma State University assistant professor Shuodao Wang and postdoctoral researcher Bo Wang; and Lee. The conducting nanowires are around 50 nanometers in diameter and more than 150 microns long and are embedded inside a thin layer of elastomer, or elastic polymer, about 1.5 microns thick. To demonstrate its utility in medical diagnostics, the device was used to record electrophysiological signals from the heart and muscles. A YouTube video about the research is available at https://youtu.be/tYRebHNi6p4. "Recording the electrophysiological signals from the skin can provide wearers and clinicians with quantitative measures of the heart's activity or the muscle's activity," Lee said. Much of the research was performed in the Birck Nanotechnology Center in Purdue's Discovery Park. "The nanowires mesh film was initially formed on a conventional silicon wafer with existing micro- and nano-fabrication technologies. Our unique technique, called a crack-driven transfer printing technique, allows us to controllably peel off the device layer from the silicon wafer, and then apply onto the skin," Lee said. 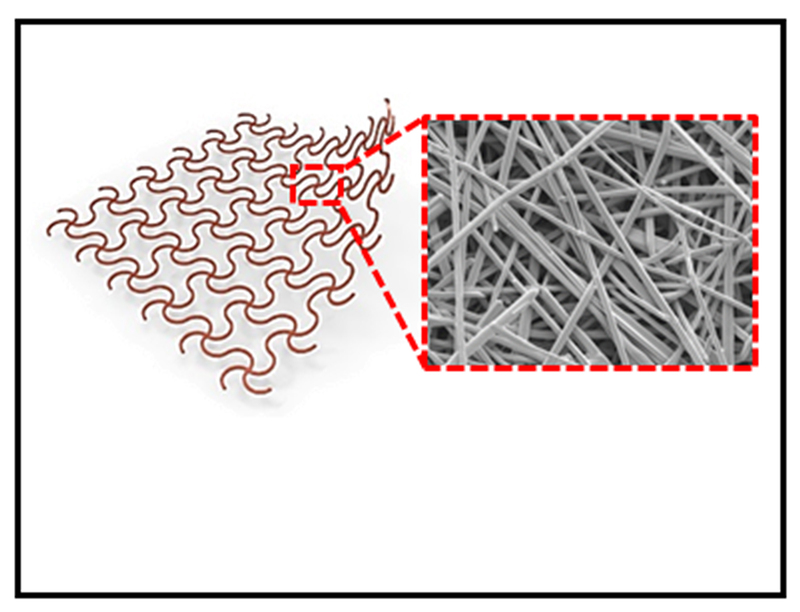 The Oklahoma State researchers contributed theoretical simulations related to the underlying mechanics of the devices, and Seungyong Han synthesized and provided the conducting nanowires. Future research will be dedicated to developing a transdermal drug-delivery bandage that would transport medications through the skin in an electronically controlled fashion. Such a system might include built-in sensors to detect the level of injury and autonomously deliver the appropriate dose of drugs. The research was supported by Purdue's Weldon School of Biomedical Engineering, School of Mechanical Engineering, the Center for Implantable Devices and the Birck Nanotechnology Center, and also partly funded by The Printing SMART Film Initiative and Eli Lilly and Co.
Lee obtained a U.S. patent on the crack-driven transfer printing process while he was a researcher at Stanford University, and other patent applications associated with the electronic bandages have been filed through the Office of Technology Commercialization at the Purdue Research Foundation. Note to Journalists: A copy of the research paper is available at http://onlinelibrary.wiley.com/doi/10.1002/adma.201603878/full or from Emil Venere, 765-494-4709, venere@purdue.edu. A YouTube video is available at https://youtu.be/tYRebHNi6p4 and other materials are available on Google drive ​at https://goo.gl/c08tka. 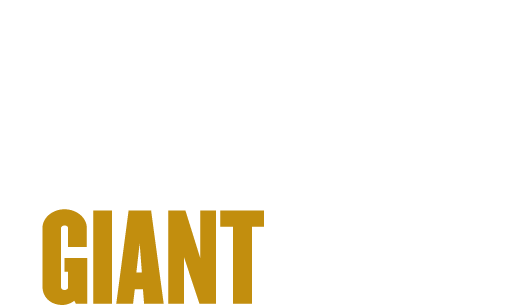 The video was prepared by College of Engineering digital producer Erin Easterling, 765-496-3388, easterling@purdue.edu. 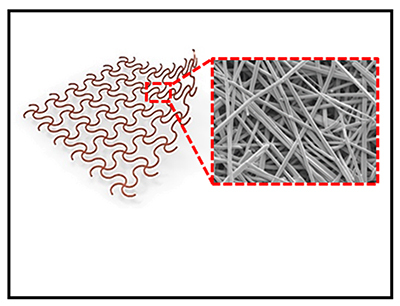 Mechanically reinforced skin-electronics are presented by exploiting networked nanocomposite elastomers where high quality metal nanowires serve as conducting paths. Theoretical and experimental studies show that the established skin-electronics exhibit superior mechanical enhancements against crack and delamination phenomena. Device applications include a class of biomedical devices that offers the ability of thermotherapeutic stimulation and electrophysiological monitoring, all via the skin.